My oldest daughter was too little for the whole baby-costume thing (she was only a month old and she was a preemie, so that didn’t work out). And because we adopted my son when he was 7, we didn’t really get to do too many baby costumes with him (like none). So, it’s with many apologies to my littlest daughter that we are now presenting the CUTEST 5-Minute S’mores Baby Costume. I can’t wait for Halloween night and trick-or-treating with this nutball. She’s so adorable I just wanna eat her up–oh, right, I’m supposed to tell you about the ONE rule with this costume: Don’t Eat The Baby. Heh. 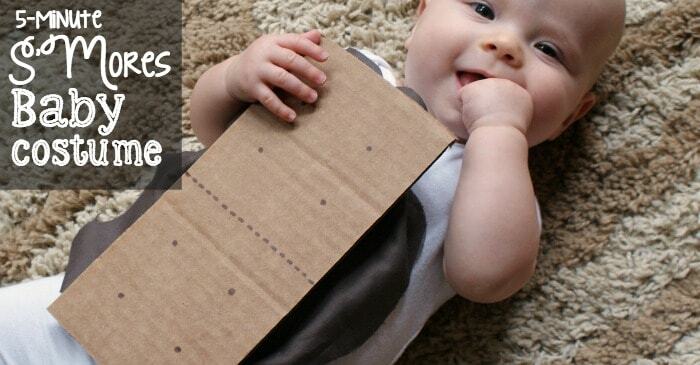 Trim the cardboard pieces to be rectangles, if you didn’t just cut the flaps off a box of diapers. On the brown side of each piece of cardboard, draw a dotted line down the center, then 8 dots (4 on each half) to look like a graham cracker. Cut the brown cloth into 2 pieces with wavy, random edges. Make sure that the pieces you are cutting are slightly larger than the rectangles of cardboard, that way you can see the “chocolate” under the “graham cracker”. Using the liquid stitch, glue one piece of the brown cloth you just cut to the back of the onsie, and one to the front of the onsie. Allow the liquid stitch to dry…meaning, it’s best to not put baby in that until it’s dry…probably don’t want the kid to be glued in the costume, just sayin’. 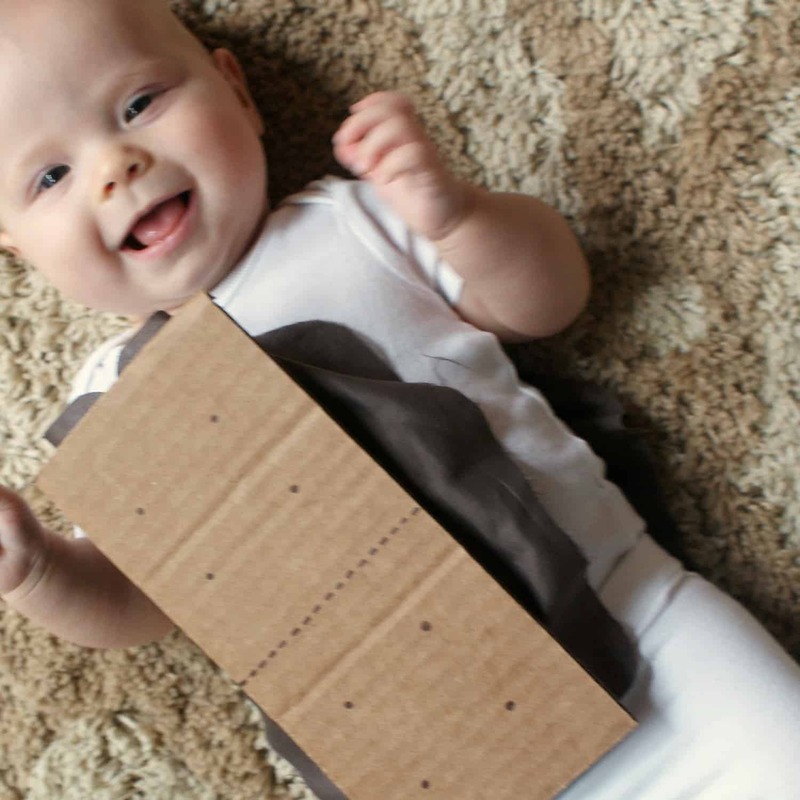 Using the placement of the velcro on the cardboard as a guide, place the velcro on the brown cloth pieces, front and back. Put the baby in the onsie. Eat! I mean, no, go trick-or-treat! Yeah, that’s what I meant…don’t eat the baby, right. One more adorable baby picture for the road, neh? Such a cute little nutball. Eep!